Bill used this Accountability System to give himself the tools to become the success he is today! Million dollar earner Bill Whittle has taken his years of success in building a big business and created this 90 Day Accountability Planner. With the input of Jim Meyer, this awesome duo have made it simple for you to strategize becoming financially independent. “Think in Ink” about where you want to be in 3 months, 6 months and in a year, and make your dreams a reality. Follow along and do what the most successful people in Primerica do. 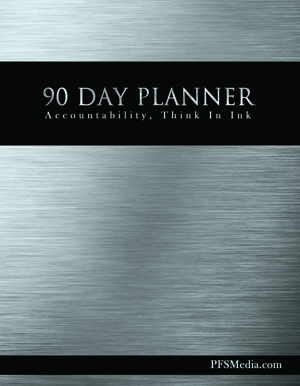 Track your performance and schedule your days and vision with this "90 Day Daily Planner - Think in Ink". This Custom designed Planner is 8 1/2 X 11 with a glossy full color cover and a durable backing, black spiral binding which allows you to fold the pages all they way behind. This version of the 90 day Daily Planner is good for use with ALL hierarchies across the USA and Canada. Discounts are available for quantity! Please see the discount chart above. Copyright © 2019 . PFSMedia is an independent licensed vendor and is not affiliated with Primerica. All marks and logos are owned by Primerica, Inc.